AT BELL’S WE TAKE OUR DRINK AS SERIOUSLY AS OUR FOOD. THAT IS TO SAY, WE LIKE LOVELY THINGS THAT LIFT THE SPIRIT, NURTURE THE SOUL AND OFFER SOMETHING A LITTLE BIT DIFFERENT. To kick off, our aperitifs are designed to tickle every fancy as well as every appetite. To quench the thirst and sharpen the tastebuds; anything involving jolly bubbles and the clunking of ice is bound to be a winner. Tonic water is our all-time favourite mixer: always great with gin but surprisingly good with other things too. Sherry remains a love of ours and we’re thrilled to have taken on wines made by Alvear, who have been making sherries in the Montilla-Moriles region since 1729. Pedro ximenez is their grape of choice and they make it into all styles of stunning sherries. And while we’re at it, when we discovered a great white wine made in Chile with sauvignon blanc and pedro ximenez, it seemed rude not to list it as well. 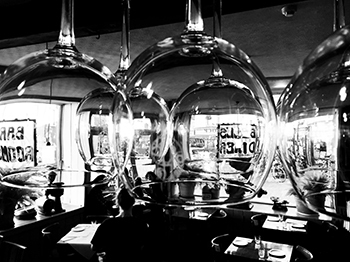 Our wines have been carefully chosen to suit our food and our personality . We have a roving eye when it comes to wine regions and fall in love at the drop of a hat so we change things around every six months to accommodate our current crushes. We remain rock-solid in love with Spain, but flit around its regions and get off with their grapes and have always found something special to drink. Volcanic soils so often give us that grip we adore so we’re still hanging around with lava-based wineries in places as diverse as Hungary, Tenerife and Sicily, and we’ve been seduced back to France where we’ve sniffed out some gloriously good wines at astonishing prices. South Africa and the good old US of A have also tickled our fancies with some stunning bottles that are sure to surprise with their delicacy and decorum. The nature of our food - lots of dishes for people to share - mean that traditional wine matching rules don’t apply. We’d prefer you drink a style of wine that you like rather than be hidebound by trying to find the perfect match. Along with unusual grape varieties from innovative producers working in interesting parts, we have some classic wines made by famously good makers so we hope you find something to suit your taste. We are particularly drawn towards wines that are organic, biodynamic and/or natural simply because we think they tend to express the personalities of their makers and terroirs so well. Our staff will be able to talk you through the list and offer advice if you’d like it. We like our guests to experiment with wines they might not usually choose so we add a modest cash margin rather than the usual restaurant mark-up which means they all offer incredible value for money. When it come to the grand finale, perfect pairings make much more sense. Ask your server for suggestions to go with your pudding that together will make up something much more than the sum of its parts. Madeira is an ongoing passion of ours and we’re introducing a stunning collection available by the glass. We also have a small but effective list of digestifs and other nightcaps for a finish with a flourish. 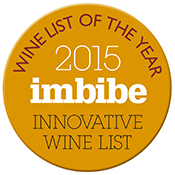 We’re delighted to have been awarded Imbibe magazine’s Innovative Wine List of the Year 2015. We do hope you enjoy it. Details here.